Packaging Size: Min 6" X 4"
- Each Bomb is tested before it leaves the factory, which gives the results of hydraulic testing under a pressure of 300 atmosphere (4400 psi.) Maintained for a period of ten minutes without sign of leakage. The maximum deformation must not exceed the specified limits. 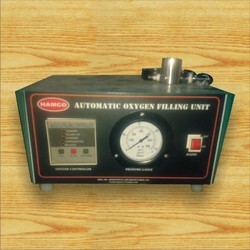 Digital Bomb Calorimeter:- ‘Rajdhani’ make Digital Bomb Calorimeter provides a simple and inexpensive method for determination of heats of combustion of organic matter and the calorific value & sulphur contents of solid & liquid fuel as per the method recommended by British standard institution BS 1016. Bomb of capacity 300 ml and circular made of corrosion resistant stainless steel alloy. Supplied complete with water jacket, regulating valve, safety valve, Digital Beckman Thermometer, Stirrer and set of standard accessories. Microteknik is a leading Manufacturer Exporter of Bomb Calorimeter Apparatus & Digital Bomb Calorimeter.